Because the first well driller didn't drill when he said he was going to, I had to pass up this years' annaul bare root purchases, usually made in December. They can be made much earlier, but the dead, dead line is mid December. After that, you can buy bare root in a local nursery, but not at wholesale or quantity pricing. With so much up in the air, I had to forgo my usual shopping trip through suppliers' catalogs. But when Paul told us we'd hit water, I did make a couple desparate calls, and got to squeeze in a few additions. Most of what I'd like is unavailable, but got a few items. We're adding 100 raspberry plants (300 row feet), 100 or so row feet of Rhubarb, and 200 heirloom Sweet Purple Asparagus plants. We're adding a few blackberries, some apples (most were unavailable), plums, chocolate persimmon, a few pears and maybe some jujubees. There's also an unusual pomegranate that is seedless, and I'll trial that. Those would be some pretty whoppin' grapefruits, but no, they're pomellos. Considerably larger than grapefruit, the pomello is milder and takes a little more work to enjoy. The segments look exactly like grapefruit, but the pithe between each segment is too tough to eat. Separate the fruit from the pithey segment material and pile into a bowl to enjoy. 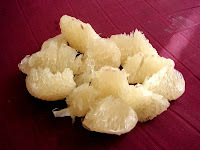 They have very little tartness to them, so some people who don't enjoy grapefruit, do enjoy pomello. I keep saying I'm going to cut the few trees we have down because we only get a few fruit on each tree and they are a whole lot of work to eat. That is, if it weren't for my daughter, Tess, who loves the fruit and doesn't mind fiddling with the whole peeling procedure. Tess is quite protective of the fruit trees she in particular enjoys, (mulberries, guava, fig, blackberry, kiwi and pumello) so for now the pumellos are safe. The weird root looking thing in baskets this week is kohlrobi. Peel and prepare much like you would beets. Cut into large pieces, steam, drizzle with a little olive oil or freshly made butter. A nice addition is a little crumbled macadamia nut scattered on top. Some people like them mashed, with butter, salt and pepper. I'm told the Chinese prepare it two ways, typically: one is very lightly sauteed and still a little crunchy, and the other is cooked fairly well to the consistency of a scallopped potato. Either way is delicious! Who knew such an ugly looking thing would be so tasty. Enjoy. For some reason, Blogger is not cooperating today, so I am posting the following for Donna - T.
Those little bitty orange looking things in the clamshell are Nagami Kumquats, in season now! Usually they come in, in time for Thanksgiving dinner. This year they're quite tardy. Chris Aliseo, Costa Mesa CSA supporter sent me this link for recipes: http://www.kumquatgrowers.com/recipes.html. My favorite use of kumquats continues to be a simple reduction. Throw them all in a blender, add water to top. Blend. Force through a sieve to get rid of the seeds. Boil down with sugar to taste into a syrup or reduction. I use the reduction in margaritas, on top of crepes, to sweeten limeade, and as a dessert topping. Another favorite is cooking them whole with a little sugar and water until they're translucent and using them as a jam.